Aerelon was primarily an agricultural world. It was considered to be the "food basket" of the Twelve Colonies. Despite this, Aerelon was ranked as one of the poorest members of the Colonies. A guide to Aerelon culture established in-game. Aquaria is famous for vast oceans and the ability to harness algae for food after the first cylon war. Aquarians place heavy emphasis on familial bonds that stem from a hierarchical culture which places the elder first. In common language many Aquarians refer to every man as brother and every woman as sister. Elders generally control all social situations. It is not uncommon for an Aquarian to ask for age, name, and marital status in order that they can figure out the proper way to address someone as the language carries formal and informal language. Should an Aquarian be on a ship they tend to view everyone on the ship as family and will treat them as such. Aquarians are famous for their rum and a drink called soju. Those who have kept an ear to the ground know that Aquaria has a history of powerful crime families that have worked together over the years to take over vast amounts of criminal territory both on Aquaria as well the other colonies. Caprica is a large blue-green planet and was the the center of Colonial civilization. According to Gaius Baltar, Caprica was the seat of politics, culture, art, science, and learning. It was also one of the wealthier colonies (Dirty Hands). Big cities on the planet were Caprica City and Delphi. Gemenon natives are called Gemenese. They are known for their literal interpretations of the Sacred Scrolls. Most of the population of Gemenon was apparently very strongly opposed to the federal laws legalizing abortion. Traditional Gemenese law declares children to be the property of their parents. Gemenon was home to the Kobol Colleges. One of the last ever professional Pyramid games was held on Gemenon just prior to the Cylon attack on the Colonies. Gemenon was one of the poorer colonies. Gemenon was home to the Kobol Colleges. A guide to Gemenese culture as established in-game. Leonis Estates Sparkling Wine was a type of alcohol produced on this colony. A guide to Leonisian Culture established in-game. Picon was the location for the Colonial Fleet Headquarters. Lukas Ulpius Banks - Former cop turned bar owner. 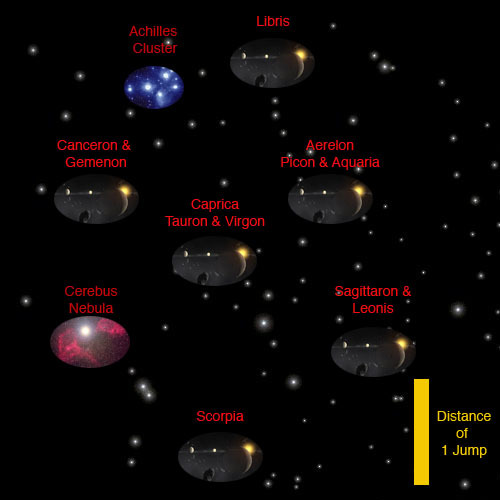 Sagittaron endured centuries of exploitation at the hands of the other Colonies, leading to the colony becoming one of the poorest planets. Eventually, Tom Zarek led an organized series of terrorist acts against the established government there, many years before the fall of the Colonies (Bastille Day). The Sagittarons are traditionalists who practice a different form of religion from the other Colonies. They believe in herbal medicine and have a general distrust of the military (The Woman King). A guide to Saggie Culture established in-game. Scorpia was home to a Colonial Fleet shipyard. Tauron was reputed to be somewhat of a troublesome colony within the federal system of the Colonies, often disobeying directives decided by the colonies and "pushing their luck with the admiralty every chance they got." Tauron was one of the wealthier colonies (Dirty Hands). At the end of the first Cylon War, Tauron was under attack from Cylon basestars and ground forces, causing many civilian causalities. A guide to Taurian Culture established in-game. CIA : Colonial Intelligence Bureau. CIA = Colonial equivalent to the Central Intelligence Agency. Whereas the Colonial Investigation Bureau handles law enforcement, the CIA is more concerned with intelligence, including extremist groups such as those on Sagittaron. CIB : The Colonial Investigation Bureau is the Colonial equivalent to the FBI. Investigates federal crimes and crimes crossing colonial jurisdiction boundaries. AAT : Aerelon Apple Twist. A popular mixed drink that originated from (you guessed it) Aerelon. Made from: White rum, apple juice, sweet and sour, and a squeeze of lime. Caprican Four Limb Boxing : A fictitious Martial Arts style, similar to Kung-Fu developed on Caprica, but practiced throughout the Colonies by some. Gramble Juice: Juice of the Gramble Berry. Thematically equal to a cranberry. You may find Battlestar.wiki helpful. For more info, see: Twelve Colonies, where the brief descriptions of the colonies (above) were taken from.